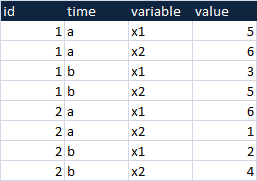 Tony Hirst pointed this out in one of his posts about R, and it got me thinking that mashing up something like this (a kind of unpivot table) in both VBA and Google Apps Script would be pretty straightforward, since I have all the components already. So lets start with how to use it. At a minimum we need to say something like this. reshapeMelt actually returns a cDataSet of the output data, so it can be used directly to chain to other procedures that know how to process these. I'll show and example of this in a later post. All options are specified in one jSon string (or as close to one as I can get within the confines of VBA syntax). The full range of options are as below. I'll no doubt be adding to this as a template for all default options for this topic. Most of this is just patching together existing capabilities - mainly cJobject and cDataSet. I had to add a few bits and pieces to cJobject but nothing major. I'll post the Google Apps version shortly.
' check if output sheet exists?
' this works like $.extend in jQuery. and that's it - happy melting. You can download all this at Downloads in the cDataSet.xlsm.